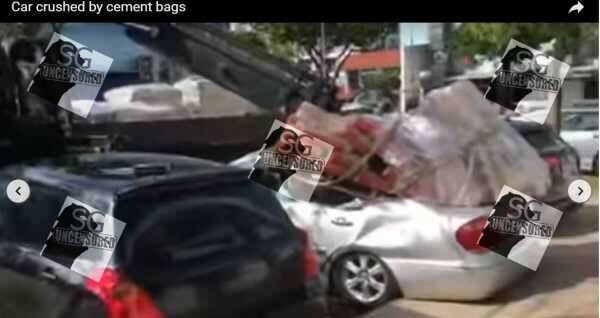 It was a lucky break that the car that was crushed by bags of cement in a West Coast carpark was empty. Looking at the photos of the car, if there was someone in that car, confirm up lorry, due to cement dropped by lorry. Now the question remains as to how this accident could have happened? Were the lorry driver and the crane operator negligent? The company that owns the lorry had refused to comment, so it seems likely that they know they are in the wrong. It was just luck that an accident like this did not involve any loss of lives. Previous ArticleOld Chang Kee Tea Break Special (2-5PM) Gives You 4 Items for Just $5!! Don’t say bojio hor! Next Article Divorce settlement Cause Desperate Man and 3 kids to sleep at corridor after selling flat! !